Both the U.S and Canadian motorcoach industries continue to be one of the most reliable, cost effective and environmentally efficient modes of transportation, according to a recent study released by the American Bus Association Foundation. Total passenger trips remained strong at 604 million as compared to 762 million (international and domestic) enplanements on domestic air carriers and 30.9 million passengers for Amtrak. The Motorcoach Census details the size and activity of the motorcoach transportation service industry in the U.S. and Canada for 2014. The study shows that the industry continues to serve a broad range of customers, from students to seniors and moves people with great fuel efficiency. The industry provides charter, tour and sightseeing services that are of vital importance to the travel and leisure industries and intercity and commuter services, which are essential components of the passenger transportation systems in both the U.S. and Canada. In 2014, the industry created a total of 128,300 jobs in 2014; 71,900 full-time and 56,400 part-time. To view the report including full methodology, click here. Key findings include a small decline in the size of companies, which is attributed to mergers and acquisitions, companies going out of business and companies discontinuing motorcoach service. 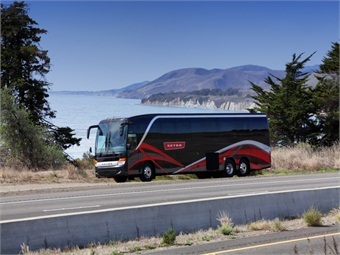 While an increase in student ridership is likely due to the fact that the motorcoach industry serves student passengers at a price point which allowed students in the U.S. and Canada to visit important historical and cultural sites that might have been out of reach without an affordable and reliable transportation option. In addition, the motorcoach industry continues to be a small business success story with over 94% of the industry operating fewer than 25 buses.